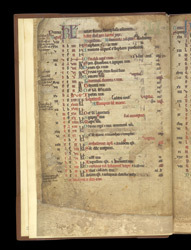 This calendar includes a number of entries relating to Durham cathedral, and to the Benedictine priory of the Virgin Mary, Coldingham, which was a cell of Durham. In the left margin, for example, half-way down the page and cropped at the edge, is a record of Herbert, prior of Coldingham. Another damaged Coldingham entry is immediately above it.